and recorded London, September 1970. I cannot understand EMI�s crazy reissue programme, and this release shows exactly why. 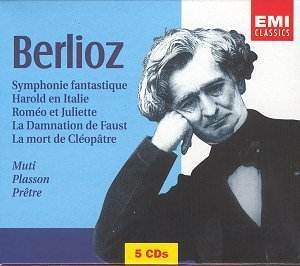 What is the point of reissuing in a box, albeit at a highly attractive price, a collection of Berlioz�s popular orchestral and choral works which are partly already in the catalogue at budget price, and have only been issued relatively recently. The last two discs in this box are already available on a Double Forte issue CDZ5 72640-2, and the Roméo et Juliette is also out on Double Forte on CZS5 62640-2. The Muti Symphonie Fantastique is also available on EMI Red Line CZS5 72552-2. How do EMI therefore think that owners of these three separate issues are likely to look upon the current release? All they are to get is the Harold en Italie, and the three Overtures. When EMI already have in their un-issued back catalogue performances that would have collectors rushing to the shops, this senseless re-cycling of the same performances over and over again seems to me to be missing the boat in a big way. No wonder the industry is in a poor shape. What about the individual performances? The Symphonie Fantastique is a good one without the extra panache and style of a Davis or a Beecham, and is recorded quite decently, with a strong sense of line. The Roméo et Juliette is similarly fine except that it is somewhat let down by its choice of soloists � chosen more for their reputation in the market place rather than their suitability to the needs of the score � compare Julia Hamari on the DG/Ozawa recording to hear what I mean. The orchestral contribution is fine albeit a little cloudy in sound, although coming no where near the performance of the orchestral items from the score played by the Philharmonia under Muti at the Proms in the 1970s. The Harold en Italie, finely played by soloist Gérard Causse is let down by poor balance. The brass throughout are recessed, and originally I thought this was down to the conductor, except they are refreshingly correct during the last few minutes of the score. The overtures are all well played and recorded but without the panache and style of a Davis or Munch. The Damnation of Faust however is pretty good, with Prêtre controlling the progress from greed to despair reasonably convincingly. The orchestra is a little raucous in parts but acquits itself well. Janet Baker, as always, sounds like Janet Baker, but her performance of Marguerite is first rate, as is that of Nicolai Gedda and Gabriel Bacquier as Faust and Mephistopheles, respectively. Finally, La Mort de Cléopâtre is well known, a superb performance sung exquisitely by Jane Baker who is accompanied with sensitivity by that sorely missed conductor, Alexander Gibson. In all then, a disappointing release, primarily because of its re-cycling provenance. If the government could get us to recycle our waste as well as this��perhaps they should contact EMI who seem to have cracked it.